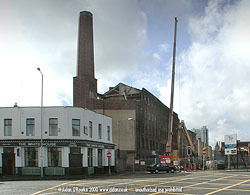 THIS MILL ON LAYSTALL STREET, Ancoats, was damaged by fire on the evening of Monday 25 September 2000, and today, Thursday, demolition work has commenced. I'm told the mill was going to be converted into apartments. 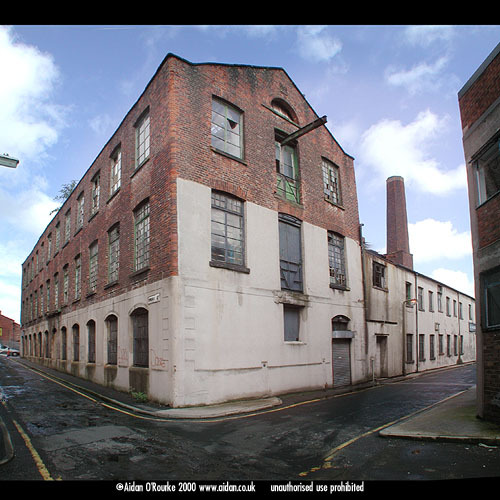 It's very sad that many of the buildings from Manchester's Industrial Revolution era are one by one being razed to the ground due to disuse and neglect. Local history expert Steve Little tells me it was occupied by Richard Johnson & Nephew from 1837 to 1873. They spun the first transatlantic cable probably on that site. They later expanded into Beswick, he added. 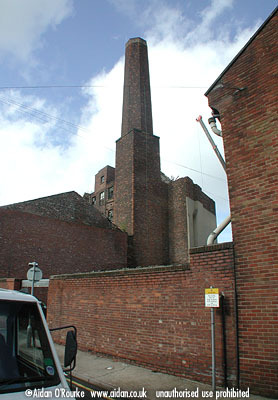 THIS VIEW OF THE FORMER WIRE WORKS ON LAYSTALL ST, Ancoats shows the chimney, which I understand is unique. The 163 year old building had been lying disused for many years, and on Monday 25 September 2000, it was seriously damaged by fire. This photo was taken the following Thursday, when demolition work started. This building is of significant historical value, as it belonged to Richard Johnson & Nephew, who made the first transatlantic cable, probably on this site. THIS IS THE REAR OF the building known as Antonia House*. We are standing on the corner of Lomax St and Brock Street, off Great Ancoats Street. In other parts of central Manchester, buildings like this have been successfully renovated, but not here - yet. The inscription on the stone near the top says '1866'. The iron girder protruding from the upper window was once used to hoist heavy items to and from the upper floors. It reminds me of former warehouse buildings in Amsterdam, now used as fashionable canalside residences. 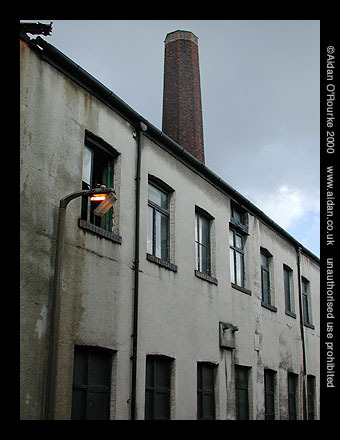 Adjoining this building is the warehouse on Laystall St which was damaged by fire on 25 September 2000. Will Antonia House have to be demolished too? This scene bears witness to the neglect and decay which blights most of Ancoats and much of Manchester - even the street light is falling apart - its sensor is damaged and the light is shining even though it's the middle of the day. 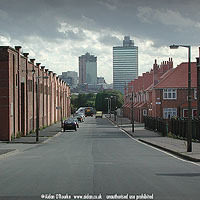 THE ANCOATS TRADING ESTATE was built in the 1990's on the site of demolished industrial buildings Great Ancoats Street. It's just across the road from the condemned mill on Laystall Street which was torn down after a fire in late September 2000. 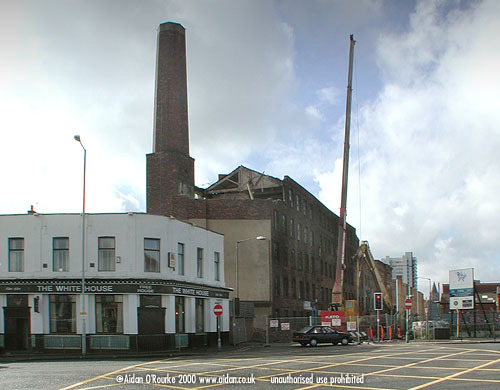 The Manchester of the 19th century is being destroyed, often to be replaced by cheap prefabricated buildings, such as this one. Look at the low standard of workmanship, and the corrosion of the exterior, after less than a decade. See how it obscures the historic mills of Ancoats, which were recently declared a world heritage site. It's doubtful this structure will survive a couple of decades, let alone two centuries. A friend from Sussex expressed his amazement that the local authority should have allowed a development such as this to be built in this historic place. Commercial prefab structures are well-suited out of town locations, but not here. Eyewitness says: Manchester is developing and modernising at a frantic pace, but too much of the city's original character is being lost. 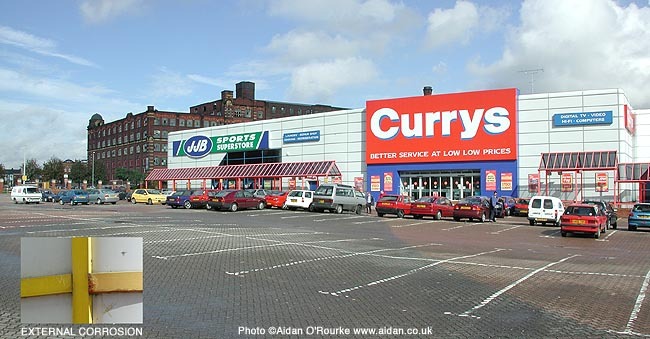 Manchester City Council is to a large extent to blame for the dissolution of so much of the historic fabric of Manchester, and for its replacement with substandard and characterless new developments, such as the one we see here. CHEETAM HILL really is built on a hill - though you mostly can't see it, as it's covered with houses and trees. But between and above the buildings there are some interesting views of surrounding districts. 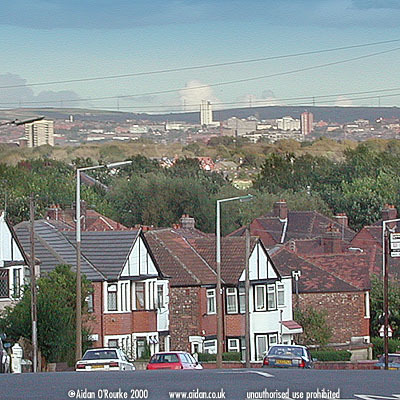 Here we are standing on the corner of Woodlands Road, off Cheetham Hill Road, looking east north east towards Oldham some six miles (9km) away. 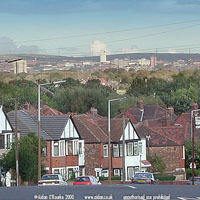 The white building which rises above the line of the hills is Oldham Civic Centre. This photo was taken Thursday 28 September 2000 at around 4pm. Note the streetlamps - in the 1970's, the standard 'Manchester-style' hexagonal upper section, mounted on the lower section, dating from the 1950's. 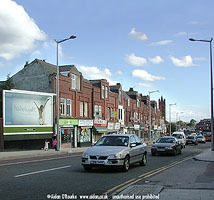 CHEETHAM HILL ROAD is seen here just down from the junction of Woodlands Road, looking towards the Greenhills Road traffic lights. The tower of the church on the corner of Greenhills Road can be seen further along on the right. We are looking south towards Manchester city centre. Road improvement work has been carried out along Cheetham Hill Road by the local authority, Manchester City Council, including new kerbs, and these silly new street lamps with their non-functional "wings". On the left can be seen Marks and Spencers' controversial billboard advert which celebrates the size 16 body of a naked woman. In this predominantly Muslim area of Manchester, many view the advert as indecent. Some civic-minded person has covered the offending rear end in white paint, just as authorities in the Middle East do with imported newspapers and magazines. In other areas of the city, the ad has been treated differently - 'Little Johnny' of Ordsall displayed his knowledge of the facts of life by scrawling anatomical drawings in felt tip pen. In most locations, the ads are free of graffiti. Eyewitness says: Very nice, can we have more ads like this please. BOYLE STREET, Cheetham, is the home of Queens Road bus depot, on the left, and out of the picture on the left, the fascinating Museum of Transport. Off the picture to the right is Temple School. In the distance, about one mile away is Manchester city centre - we can see three of Manchester's tallest office buildings - from left to right Portland Tower (formerly St Andrew's House), built 1962, The Sunley Building, opened 1965 and still the tallest tower in Manchester, the CIS building, opened in 1962. There are lots of grey clouds hanging over the city centre, but as we can see from the hard shadows, the sun is shining here Cheetham. Note, the wall-mounted street light on the left, one of the few surviving examples of a design which was put up all over Manchester and beyond during the 1950's'. The street lamps to the left and the right have been upgraded by mounting a metal section on top of the older moulded concrete post. MORE PICTURES OF MANCHESTER and district will follow shortly.